Sweet Jeanette: GUEST POST Julia from Work...Wife...Mom...Life! Today, I'd like to introduce you to my new cyber-BFF, Julia. Julia's blog Work...Wife...Mom...Life! .is from the working mom's perspective and she's agreed to be my guest today to share with us. She's sharing her recipe for Pepermint Bark. Yum-O! So, not to keep you in suspense any longer....heeeere's Julia!. Because you have so much fun, your family is awesome, your kids eyes' sparkle at the sight of the tree and you love blessing others with warm cookies and unexpected gifts. Because it stresses you to the max, you can't stand wrapping another present, you've sworn off shopping, and you're dreading the days that your family is in town. For me, I've sworn off letting the holiday stress get to me. Especially as a working mom who doesn't have a lot of time to shop, plan and prepare. So this year, instead of stressing about what co-workers to give gifts to and how much that's going to cost me, I decided for an economical, tasty and easy treat that will work for friends, neighbors and co-workers alike. Step 1: Melt almond bark in a saucepan on low heat. Stir continuously. (You don't want it to burn!) Place candy canes in plastic bag and crush with a wooden spoon. Step 3: Carefully spoon melted bark into the silicone ice cube trays. Gently tap the tray on the counter to settle the chocolate and remove any air bubbles. Step 4: Place ice cube tray in fridge for 1 hour (or overnight). 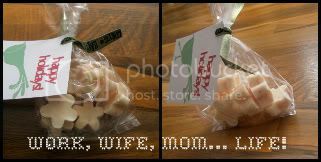 Step 5: Gently pop the bark out of the trays, place in plastic candy bags and decorate with a cute handmade tag! 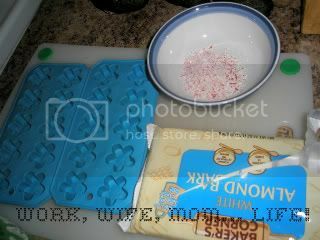 Once the melted bark is in the ice cube trays, sprinkle more crushed candy cane on top. Use a mixture of white and dark chocolate almond bark, layering one then the other. Pour the bark in a large cake pan and spread thin. Once hardened, break the bark up with a knife. INow, you can ensure the tears are tears of happiness because everyone got a lovely handmade gift and you saved some pennies! 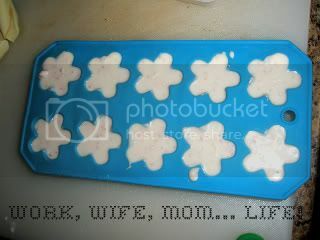 Love this idea with the silicone ice cube trays!! Where did you find those cute shaped ones? Bark is such a quick and versatile treat! I have a friend that made espresso bark one year and it was delicious (even for a non-coffee drinker)! YUM! You can also add oreo's to that. So yummy.. although not as pretty.